Upon first taking this product out of the box I was impressed by how compact the design was when stored. This makes it nice and convenient to take with you as you go into your preferred area to hunt. Just about everything built into this product is designed with compact storage in mind. Included in the package is a nice CR123 Lithium 3V battery also. These are known for being able to power up a minimal energy device like the Armasight wearable night vision goggle for an extended period of time. It is a good feeling to know that you will not have to worry about a battery replacement if you are hunting throughout an entire night. These batteries also do not add any significant weight to this product like other types of batteries sometimes do. I highly recommend a quick reading of the easy to understand owner’s manual that is included with this product before going into the field with this device. I myself prefer a head mounted night vision device over one I carry in my hands. There is much less arm fatigue involved and we all know you don’t want arm fatigue when it comes time to shoot. This Armasight product is a very affordable night vision product that will make for an easy entry into comfortable nighttime hunting for anyone that wants to try it. Although the technology used in this goggle is not state of the art military grade, it still will more than adequately help you identify game so you can bring them down at night. It has pretty good resolution and offers you a lot of conveniences when using it too. There are even several optional accessories that you can purchase for it that will further customize its use for your individual needs. This Armasight goggle makes good use of its very reliable infrared technology. The resolution is excellent with the IR technology it uses. I did not have any trouble picking out targets with using this goggle on my hunts. It makes good use of the generation 1 infrared technology that is built into it. The infrared optics it includes also have a convenient built-in flood lens feature which can make it easier to see low light signature objects when it’s activated. This I found especially useful when going to and from my hunting spot under extremely dark conditions. This goggle is designed to help you move around at night as well as spot game. That is why it was only built with 1X magnification. 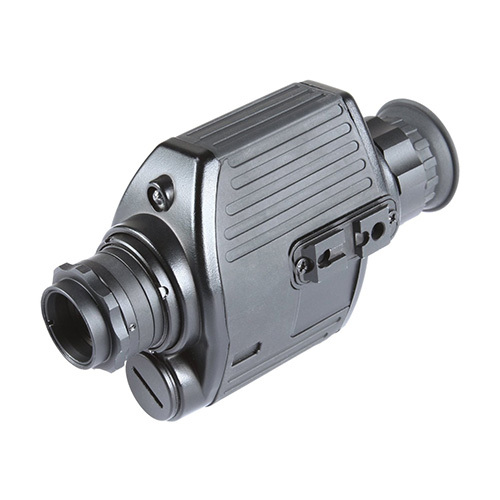 There is an additional Armasight IR810 long range illuminator available for purchase if you want to use this as a longer range animal spotter too. Make no mistake about it; this hands free device makes it easy to go to your chosen hunting spot even in the dark and will more than adequately help you spot any game in that area when you get there. The optics it has is excellent for a night vision goggle in its price range too. They include 100% glass coated lenses that are designed to give you a full 35 degree field of view no matter what distance you are looking out at. This is accomplished by the manufacturer choosing to use a wider angle 20mm lens on this night vision device. Although any head mounted night vision google will become a little uncomfortable with prolonged use, this Armasight wearable night vision device has many features built-in to help with that. It includes a padded chin strap for additional support and a padded area where it rests on your forehead too. All the straps are fully adjustable and it can even be adjusted to use over a toboggan for cold weather hunting use. One of the most common problems I have when hunting at night is eye strain if I look through the optics for an extended period of time. Even the most expensive night vision goggles are nowhere near what you see out of your naked eye and this causes eye fatigue over time. With the flip-up design of this model it makes it really easy to take a break from viewing with the optics without having to go through the inconvenience of taking the goggles on and off to do it. This products rubberized construction is also very durable and virtually waterproof. That means you can hunt with this goggle in all kinds of different weather conditions and you also do not have to worry about it becoming chipped or broken if you occasionally accidentally bang it on something. What I Liked Best about These Particiular Night Vision Goggles? I would have to say that by far the best feature of this nighttime hunting product is how convenient it is to use. Head mounted night vision devices take a lot of the work out of hunting at night because they do not have to constantly be taken in and out of a storage pouch as they conveniently flip-out of the way when you don’t want to use them. All the adjustments for viewing can be easily reached and controlled while wearing it. This google is also designed to be used for longer periods of time because of the way they fit over your head and make use of the additional chin support too. You won’t get any of the arm fatigue that you normally experience with the prolonged use of a hand held night vision device. You won’t find many more reasonably priced wearable night vision devices then this goggle from Armasight. It also does the job of spotting game at night very adequately to say the least. This goggle makes getting to and from the areas at night where you like to hunt very easy and it also does a good job helping you spot and identify potential targets within close shooting range. Its features are all well designed and it’s clear a lot of thought went into that process. Add in the facts that it is built very sturdy and adjusts easily then there is a lot to like about this very well designed night vision product. I have no problem recommending this product to enhance your chances of successful hunting at night.